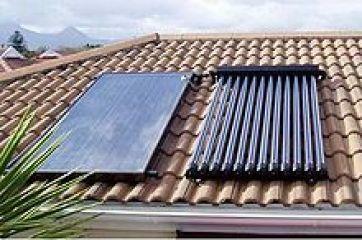 Besides being the most efficient solar collector at absorbing the suns energy, solar vacuum tubes have other advantages. 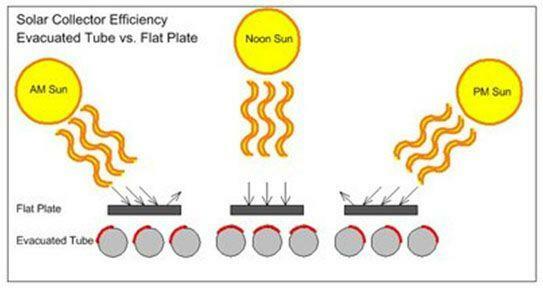 With Flat plate solar collectors the solar rays strike the panels at an oblique angle during the early and late parts of the day and are only perpendicular at midday. Calculating the angle of a solar collector plays an important part in the flat panel's performance. Solar angles (the angle at which the panel meets the sun) plays very little role with solar vacuum tubes as the sun is always striking at an optimum angle. Because of the pure vacuum, there is virtually zero heat loss. This is evident by touching a glass vacuum tube which is cold while the liquid inside can be boiling. Almost 94% of the suns energy is directed to the inside of the tube and is captured. Flat panel collectors will always loose heat through the glass, and become less efficient at higher temperatures. The Advantages of solar vacuum tubes with copper heat pipes have a further benefits over other solar systems in that they can be scaled down by unplugging a couple heat pipes. Because the internal heat transfer fluid is isolated, removing a tube will not shut down the system. This allows for some seasonal control. In the summer month you may find the solar system produces too much heat, you can simply unplug a number of the tubes to scale back the output. This also means that a broken vacuum tube will have little effect on the operation of the system. Solar Vacuum tubes can operate at a much higher temperature and as such are the preferred choice for solar home heating applications as well as solar space heating, solar process heating, solar air conditioning, and commercial solar heating applications. The growth world wide for solar vacuum tubes is growing exponentially and is expected to surpass flat plate collectors within the next 5-10 years. Currently Asia used 95% evacuated tubes in solar applications and Europe is quickly adopting vacuum tubes in areas such as home heat and even solar air conditioning. As the temperature differential between the ambient temperature (outside) and the operating temperature (inside vacuum tubes) increase vacuum tubes become the obvious choice. 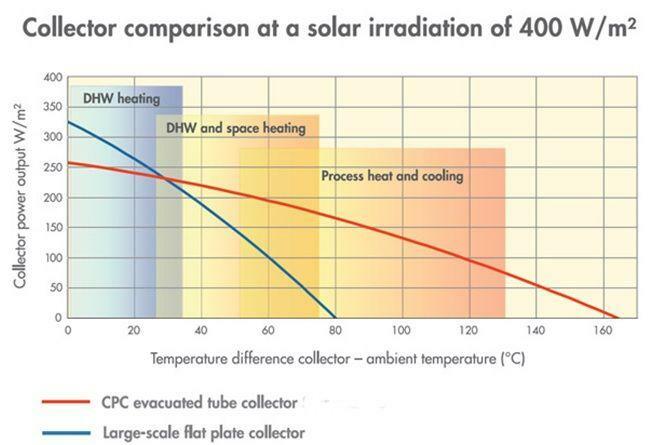 This can occur either in colder weather or for hotter applications such as space heating, process heating or combination systems that provide both solar domestic hot water and space heating SEE GRAPH. The solar vacuum tube efficiencies makes them a better choice when there is a larger temperature difference required. Corrosion and freeze free; there is nothing within the evacuated tube to freeze and the hermetic sealing of each tube eliminates corrosion. The insulated manifold header and can withstand sub zero temperatures for a short period.